Over 1,500 handmade rugs, specialist rug cleaning, repair and insurance valuations. Why have your rug professionally cleaned? Counting knots isn’t rocket science but there are some traps that customers can fall into. There are a different types of knots but the most popular are the symmetrical Turkish knot and the asymmetrical Persian knot (these aren’t exclusive to Turkey and Persia – a whole other post – and they use Turkish knots in part of Iran). 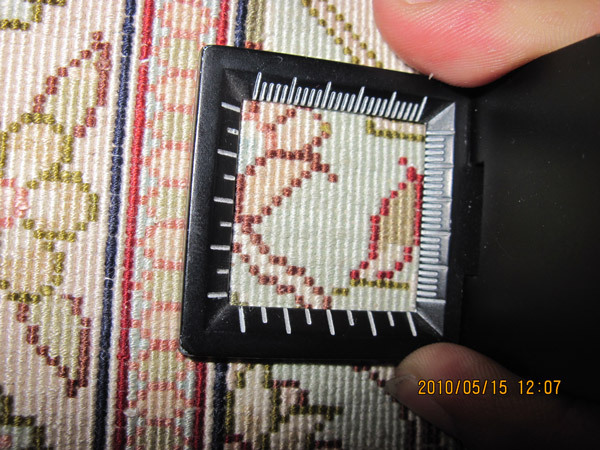 While the type of knotting can be important for appraising the origin of a rug it is vital when looking at knots per square inch (KPSI). In general, counting the KPSI you simply measure the knots across a vertical and horizontal inch and multiply the two. 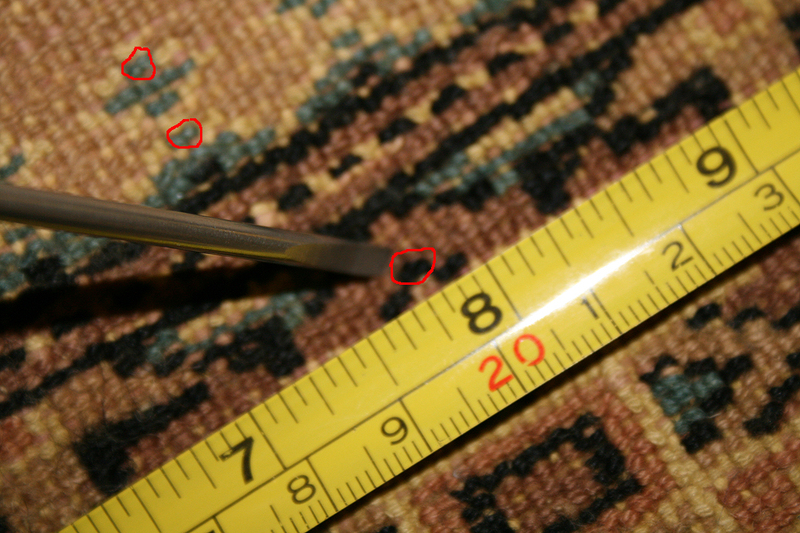 Most rugs fall between 100 and 200 KPSI. Some rugs such as Heriz, tribal rugs and lower quality town/city woven rugs fall under 100 knots and over 200 KPSI the rug starts to become fine. The finest rug we’ve seen at Little-Persia was a silk Chinese rug measuring around 2100 KPSI but most high quality silk rugs are 400-800 KPSI. When it comes to the Turkish knot things are a bit deceiving. Below you can see the more common Persian knot, the nodes you can see on the back each represent one knot. Next is the Turkish knot, if you look closely you will be able to see that there is no individual colour on the rug in terms of nodes, even at the peak of a flower or triangle there will always be two nodes (or an even number) that is because these pairs of nodes on a horizontal axis are actually only 1 knot. Unscrupulous dealers and traders will attempt to count each node on a Turkish knotted rug as one knot. When counting the KSPI of these rugs the number of nodes horizontally should be divided by 2 when counting the KSPI. Can you tell the difference between a Turkish and Persian knot? 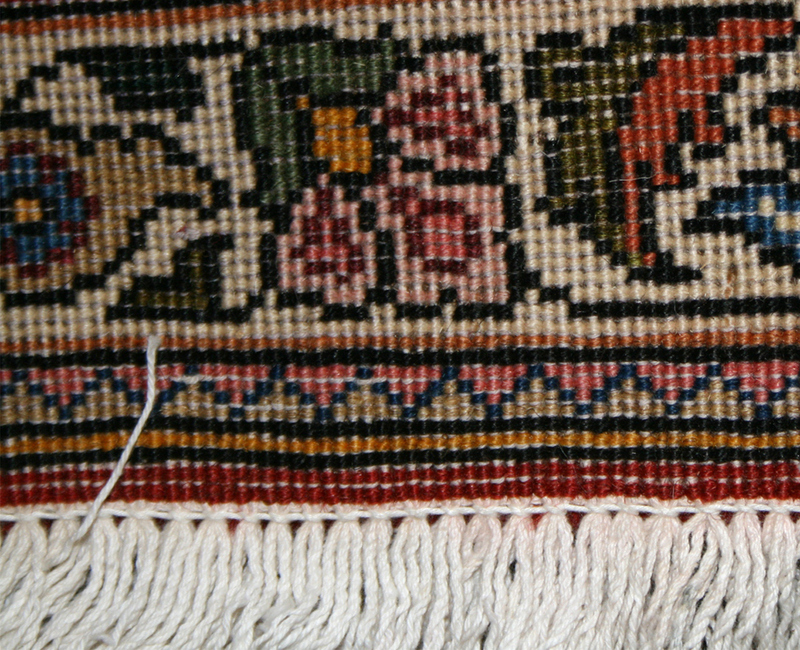 Browse through the Persian and Oriental rugs on our site and try to find those with a Turkish knot (many of our rugs have images of the back). Ryan Malone is the marketing and business development manager for Love-Rugs and Little-Persia. This entry was posted in Persian & Oriental Rug Education and tagged carpet, construction, hand-knotted, handmade, knots, KPSI, oriental, persian, rug. Bookmark the permalink. Welcome to Little-Persia’s Persian & Oriental Rug Blog | Persian & Oriental Rug Blog: Little-Persia on Why have your rug professionally cleaned?